As a guitar it's fairly average, but what's more important is what the RGKP6 represents: an affordable analogue-meets-digital future. Opens up a whole world of sonic options. Sample yourself, manipulate effects. Not all of the MKP2S' effects are suitable for guitars. If there's one buzzword being bandied around by the bigwigs at Ibanez's Nagoya HQ, it's 'innovation'. Mere months after the RG9 landed, news of the RGKP6 hit: a guitar that marks a brave collaboration with Korg, and puts a Mini Kaoss Pad S2 - an effects processor, sample recorder and audio player complete with a touchpad - at your fingertips. "Simply remove the Mini Kaoss Pad's back panel, clip it into the dock and connect the cables and you're set"
The idea of a touchpad on a guitar is nothing new - Matt Bellamy's been showboating with X/Y pads on his custom Mansons for years - but getting hold of both for just over £300 is. Admittedly, the Pad isn't built into the RGKP6; rather, the guitar features an additional rout with a small plastic dock, plus a pair of cables. Simply remove the Mini Kaoss Pad's back panel, clip it into the dock and connect the cables and you're set. 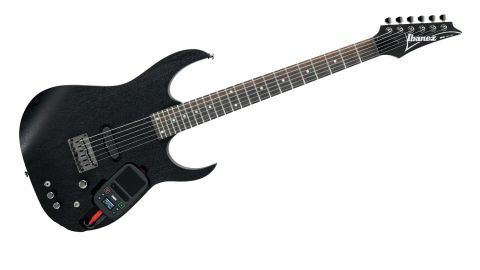 The RGKP6 is a barebones affair; there's only one pickup (a stacked Ibanez humbucker), no selector and no tone control. It's the more unusual stuff we're interested in: a master volume controls both the guitar and MKP2S levels, while a switch takes the Pad in and out of the signal path. At the base of the guitar, another toggle activates a distortion circuit, fine-tuned by nearby tone and gain controls. With around 100 effects, first experiments with the MKP2S can be bewildering. There are abundant filters, modulations, delays, reverbs, vocoders and synths, all adjustable via the RGKP6's touchpad - with a bit of practice, you can even manipulate them using your little finger while picking. The value slider scrolls through effects and offers three favourite slots, while the tap/bpm switch sets the effect rate. The most useful feature for guitarists is the hold button, which freezes the current sound, and allows you to take your fingers off the pad. This effectively turns the MKP2S into a multi-effects unit, with flangers, phasers, tremolo, delays and more. The MKP2S was designed for DJs, so not every sound is applicable to guitar. There are some seriously cool effects (the break looper's dubstep-style drops and the slicer's swaying, speed- altering wobbles), but some - the disco siren and 90s multi-effects- worthy pitch-shifter - have little musical purpose. Controlling the effects takes some getting used to, too; tapping the exact same spot to keep your modulation in time or your synth on pitch is a real labour of love. Recording your playing for sampling and triggering is more straightforward, using the function and play buttons, and you can even jam along with your own tunes via a micro SD card. In the right hands, the RGKP6 is a creative weapon; if guitar were to cross over to dance genres, this would be the instrument to do it with. But while the guitar itself is nothing special, its sleek Wizard-aping neck is easy on the hands and the stacked humbucker's output is balanced enough to handle clean and distorted sounds.